Dream Pony Kits are quite simple to assemble. It is generally easiest to paint the model first, then assemble it. Just about any paint can be used with hobby acrylics or enamel paints being most common. Before painting, wash the model with dish soap and warm water to remove any grease from the molding process. Rinse thoroughly and allow to dry. 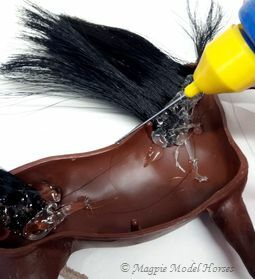 Use a dremel, files, and sandpaper to smooth the molding seams and remove any other excess plastic; some of the Welsh Ponies will have an extra "pin" in their muzzle, this needs to be clipped out before the shell will properly close. Then paint as desired. Assembly supplies needed include: plastic wrap, hot glue & glue gun, plastic glue (we use Revell Contacta with the needle applicator), PVA white glue, scissors, and hair. Use extreme caution with the hot glue as it can burn skin and ruin clothes. There are various ways to prepare the hair plugs. This way is the least hazardous. On a glass or smooth plastic surface, spread a line of PVC glue. 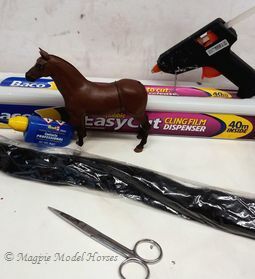 Working with small hanks of hair, cut the hair to the desired length, and lay the tip of the cut end in the line of glue. Holding the hair tightly to the glueing surface, use a flat tool to firmly brush the end of the hair, with glue. Press fairly hard to work the glue into the hair, flip the hank over and repeat the spreading process until about a 1/4 inch is coated. Create enough hanks to run the length of the neck plus one for a forelock. Cut longer hanks to make plugs for the tail. 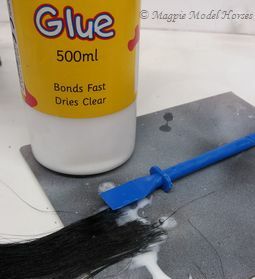 After the hair plugs have dried, peel them from the glueing surface and trim away the excess dried glue. Open your shell and lay the left side inside up on a flat surface. Use your glue gun to make a line of hot glue along the line of the neck. Quickly place the hair plugs onto the glue line. After 30 seconds or so, gently press the plugs into the glue. Lay a few more lines of hot glue over the ends of the hair plugs to more fully secure them. Combine the tail plugs into one large hank. Make a hot glue blog in the shell below the tail hole and carefully press the tail plug into it. Apply more hot glue to fully secure the tail plug. With the plastic glue, carefully spread a very thin layer around the flat inside lip of both sides of the shell, with a few drops on the inside pegs and holes. Press the two sides together, being careful not to trap any hair. Cut three strips of plastic wrap and use them to tightly bind the belly, neck, and muzzle. It is best to leave the glue to set overnight. 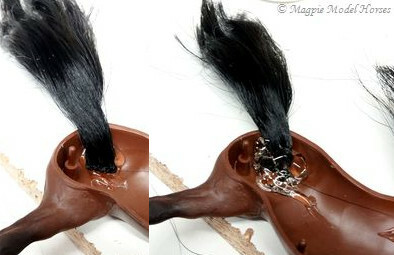 Once the glue has set, unwrap the model and style the hair. 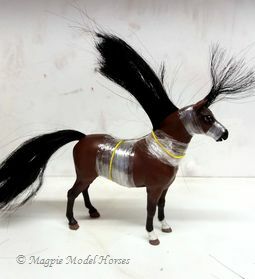 Copyright © 2015 Magpie Model Horses. All rights reserved.